Super-Sod is scheduled to join Augusta’s Sacred Heart Garden Festival for the first time. 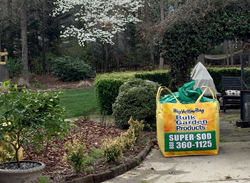 Gardeners at the Sacred Heart Garden Festival will have the opportunity to purchase BigYellowBags of Soil3 organic compost for delivery to their gardens. The Sacred Heart Garden Festival is a very high quality event in a grand venue, and we are certainly looking forward to participating in this year's festival. During April 21-23, Super-Sod will join the vendor market of the Sacred Heart Garden Festival in Augusta, Georgia. This festival offers entertainment for everyone — from the avid gardener to the landscape admirer — during the three-day schedule. “The Sacred Heart Garden Festival is a very high quality event held in a grand venue, and we are certainly looking forward to participating in this year’s festival,” said Super-Sod’s Joe Livingston. Super-Sod will offer sod and organic humus compost at the festival’s vendor market, centrally located at the Sacred Heart Cultural Center in downtown Augusta. Among the unique plants, home accessories and garden accents, visitors will have the chance to learn about Super-Sod’s products. “Our lineup of premium quality products — such as our farm-produced Soil3 organic humus compost, the South’s premier selection of top quality turfgrasses, the original Centi-Seed centipede grass seed, and Zenith Zoysia seed — are a great fit for this outstanding show. We look forward to seeing lots of our friends and customers there!” Livingston said. Super-Sod’s star product, Soil3 compost, is created at Super-Sod turfgrass farms in Fort Valley, Georgia, and Orangeburg, South Carolina. Composed only with manure from local dairies, grass clippings and wheat straw, the mix is heat treated to 160 degrees Fahrenheit to eliminate any weed seeds. Thanks to controlled ingredients and an absence of residual pesticides, Soil3 is OMRI listed by the Organic Materials Review Institute for certified organic gardening. Beyond browsing the offerings of vendors, attendees of the Sacred Heart Garden Festival have the opportunity to tour five local gardens, hear from experts in the horticulture field and view landscape and floral creations by local horticultural businesses. Special events during the festival include Friday Night in the Garden and Garden Festival Tea. The Sacred Heart Garden Festival celebrates the arrival of spring and raises funds to support the Sacred Heart Cultural Center. Formerly a Catholic church, the SHCC now hosts a variety of cultural activities — from ballet performances to art exhibits. To purchase tickets and for more information, visit the festival website. Super-Sod, a subsidiary of Patten Seed Company, is a family-run business that employs experts in turf and horticulture. Patten Seed Company began in 1893 in Lakeland, Georgia, as a general store, providing seed for customers. Since then, Patten Seed Company has brought innovation to the turfgrass industry through production of different seed and sod varieties. Super-Sod was formed in 1980 to market sod to expanding urban markets. Super-Sod continuously develops new garden products; fosters gardening and landscaping; and seeks improvement in farming practices, technology, environmental stewardship and employee knowledge. Find more information at SuperSod.com.